Susan Walston, President of the Haysville USD 261 Board of Education (center) presented the Star Polisher Award to two District employees at the BOE meeting on January 26. 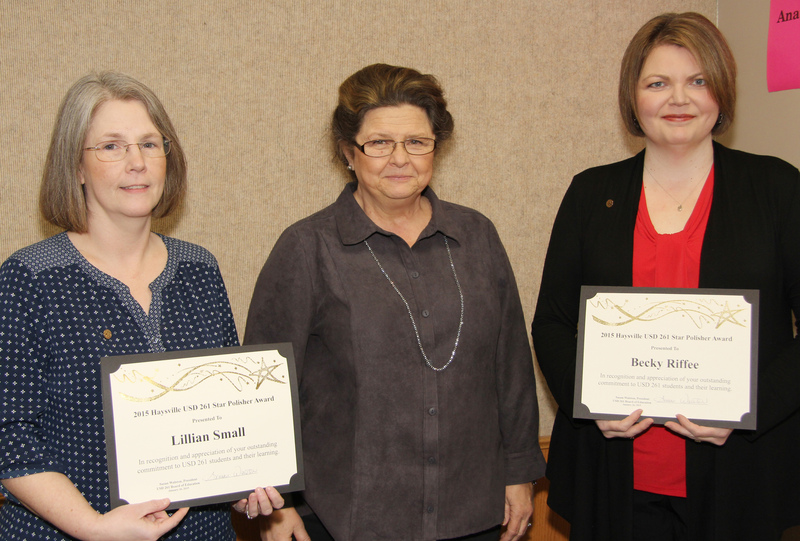 Honored were: (left) Lillian Small, Prairie Elementary School Library Clerk, and (right) Becky Riffee, Campus High School Vocal Music Teacher. The Star Polisher Award is a district-wide recognition given by the Board of Education in Fall and Spring to honor outstanding service by certified and classified employees. Nominations can be made by anyone – peers, supervisors, parents, students or district patrons.